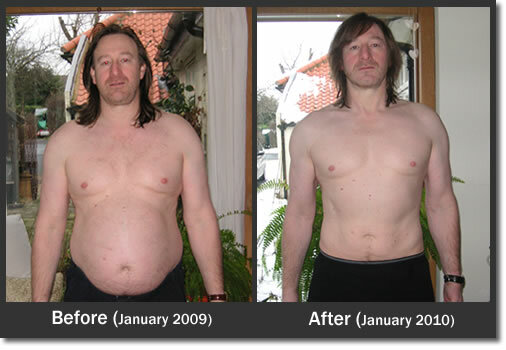 On the first of January 2009, I set a weight loss target to lose 4 stone over 12 months. I was going to do this without ” going on a diet ” I would not ban any of the foods I enjoy, instead I would simply reduce the number of calories I ate. Well this weekend , with a little over 2 months to spare, I have achieved my goal. My weight today is 12 stone 7lbs, or 175lbs – 79.5 kilos. Over the years I have tried many different things to not only reduce my weight, but also to control it. Nothing has ever been so easy or so effective for me as using Intermittent Fasting. In 10 months of using I.F I have not felt deprived, I have not felt at any time that I was on a diet and I think this is the single biggest reason for achieving my target. So now I have reached my target what next ? … Well first I am going to see if I can get the classic 6 pack, I also want to try and reduce my body fat a little more, and continue to tone up. I do believe it is important to always set new targets, so for the end of the year, I am just going to try and improve my strength and fitness. Update Jan 2010 If you arrived at this page without knowing my story, You can see my weight loss before and after pictures here .I have included one on this page since the original post was done in October. 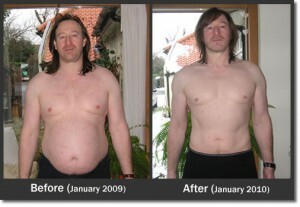 Drop me an email or comment and let me know about your own intermittent fasting success stories. BRAVO, BRAVO, BRAVO!!! Congratulations on reaching your goal. I have been following your blog thru the months and have been so inspired by you. I have followed IF in the past, just recently tried it again, and “failed”. I lost my job, found my self not keeping busy, and eating during the day to allay my financial insecurities. I will try again. Will you please post some progress pictures? Also, keep us posted on your maintenance experiences. Again, congratulations on reaching your goals! You must feel fabulous!!! Hi Jersey, thanks for the reply. Yes I will post some pictures, One of the only reasons I have not done so at the moment is I know many of these get taken and used on fake testomonials, so I want to put mine together with a video, so people can see that it is real. I will keep posting my progress, as I say I have now decided the goal for next year is the 6 pack, so we shall see how that goes !. Best wishes with your own I.F journey. Well done – fantastic work!! Cheers Jonathan , I know I keep saying it , but stopping obsessing about what i ate and focusing instead on how much I ate was all it took for me.